The Vine chosen is Guelder Rose which is extremely easy to grow and care for and adds a remarkable delight to any garden. 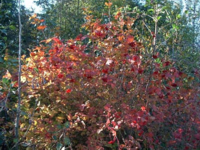 Any soil is good for the Guelder Rose, and it particularly likes heavy clay boggy soil. Actually, mulch through winter is essential too as apple trees do not like consistent frost and ice. preferred light, shade and water conditions? Almost all light conditions can be tolerated though more light does mean more blossoming and rose hips. Water, as I mentioned, it likes lots of it and loves boggy ground. Buds form from late February until mid March and burst into leaves quite quickly. Blossoming time is through April and May, white flowers that attract many bees and flying insects. Beautiful red berries form during September and October, and the birds love these berries even though they are quite toxic to humans when raw, but have many uses when cooked or brewed.